1957 to 1962 Studied the influence of nuclear tests on Semipalatinsk region on the health of population in cooperation with Dr. Atchabarov. Presented research on "Soi 1 radio-activity in Central and East Kazakhstan in collection : Radio-activity of environment and people's health". 1962 to 1968 Deputy Director at the Institute of Oncology and Radiology. 1969~ Director at the Institute of Oncology and Radiology. 1989~ Prticipates in the Semi-Nevada anti-nuclear movement. 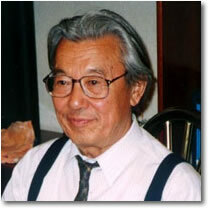 1996~ Honorary Director of the Medical Branch of the Academy of Sciences at the Republic of Kazakhstan. Awards Sept. 1997 Presented the Republic of Kazakhstan Distinguished Award by both the Health Ministry and the Science and Technology Ministry of the Republic of Kazakhstan. He is the leading person whose research helps clarify the influences of nuclear tests on the Semipalatinsk region under the military regime of the former Soviet Union from 1957 to 1959. He has a close relationship with Nagasaki Association for HibakushasÕ Medical Care (NASHIM) and Nagasaki University School of Medicine. "Soi 1 radio-activity in Central and East Kazakhstan in collection: Radio-activity of environment and people's health", published by NASHIM as the first translation into Japanese, is the best publication to let the public know what nuclear tests on the Semipalatinsk region had brought about with a historically accurate view. Furthermore, in August 1993, Dr. Balmukhanov was introduced as the most conscientious doctor when NHK (national public TV broadcasting in Japan) covered the above issue in a feature TV program.